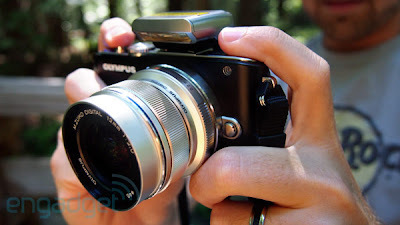 It is Olympus Pen E-PL3. Well, I don't know much about photography jargon but what he showed me made me drool... He snapped a picture of my hubby - he looked good (but of course my husband said he is always handsome, yeah, yeah ... rolling eyes). The guy snapped my daughter jumping, everything was clear meaning that the speed was good. The only down side is that it is expensive. We just spent a fortune on our porch reno. And I need to purchase another lens to be able to do all the pretty things. I told the guy 'I'll sleep on it'. I always wanted a proper camera to take nicer pictures for the blog. My instinct tells me that I might get it - my birthday is on Sunday. That if my husband gets all the signals right... finger crescent! Dear sis, thanks for dropping by my blog. Please like my fb page color me pretty by nadia for more updates on my crafty work :) its great to hear from you again!